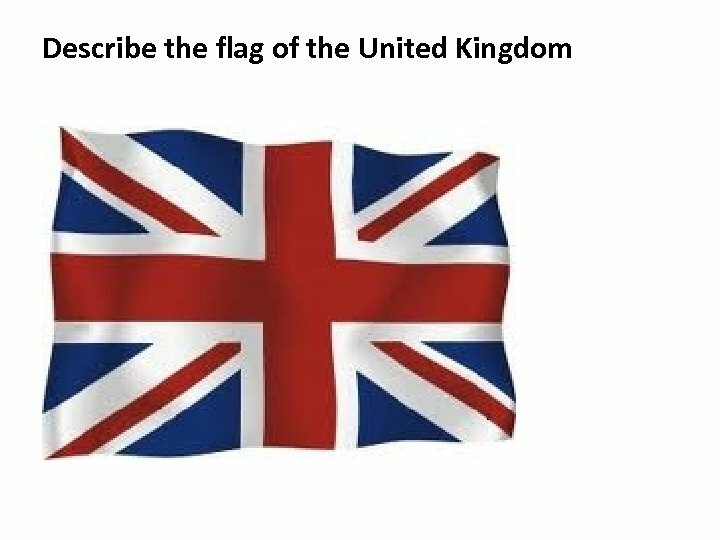 Answer the questions: • What parts does the United Kingdom consist of? 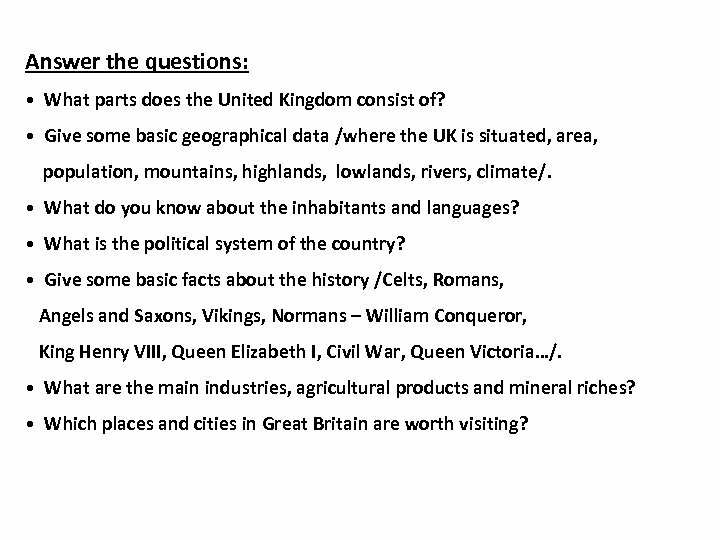 • Give some basic geographical data /where the UK is situated, area, population, mountains, highlands, lowlands, rivers, climate/. • What do you know about the inhabitants and languages? • What is the political system of the country? 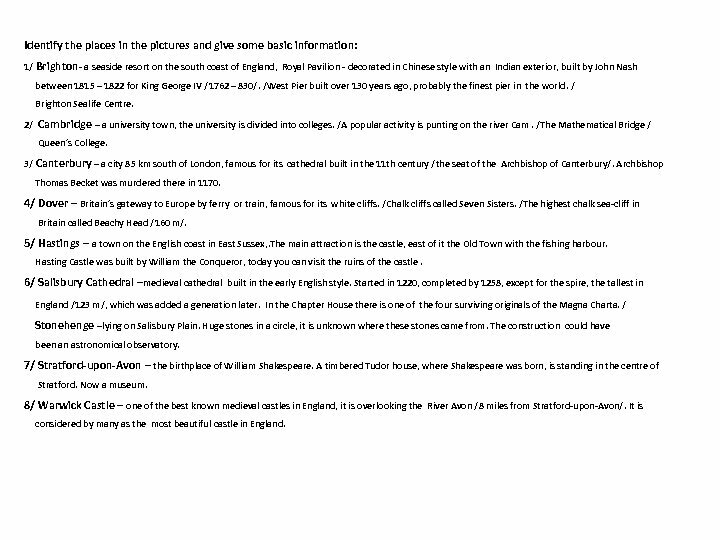 • Give some basic facts about the history /Celts, Romans, Angels and Saxons, Vikings, Normans – William Conqueror, King Henry VIII, Queen Elizabeth I, Civil War, Queen Victoria…/. • What are the main industries, agricultural products and mineral riches? 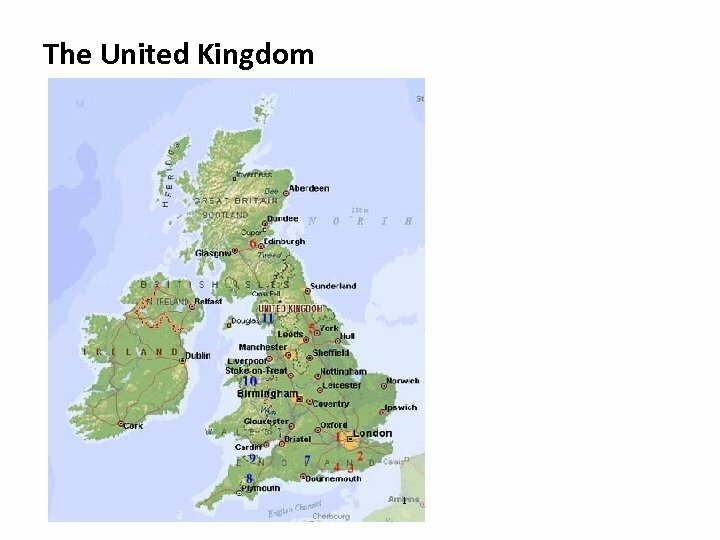 • Which places and cities in Great Britain are worth visiting? 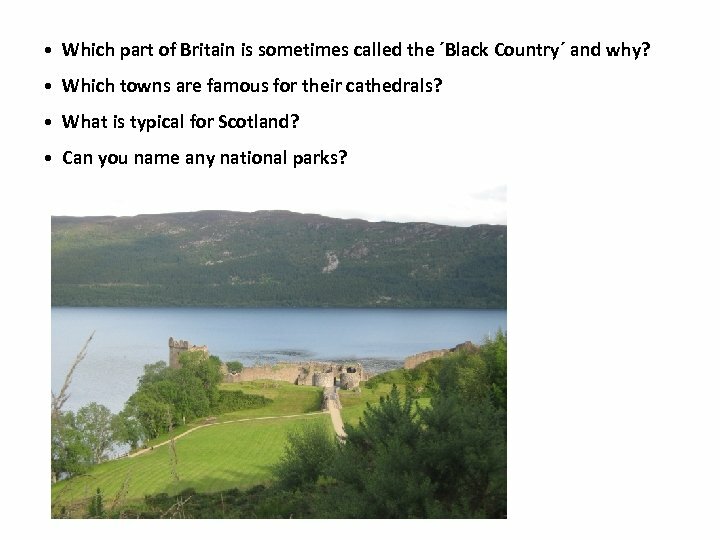 • Which part of Britain is sometimes called the ´Black Country´ and why? • Which towns are famous for their cathedrals? • What is typical for Scotland? • Can you name any national parks? 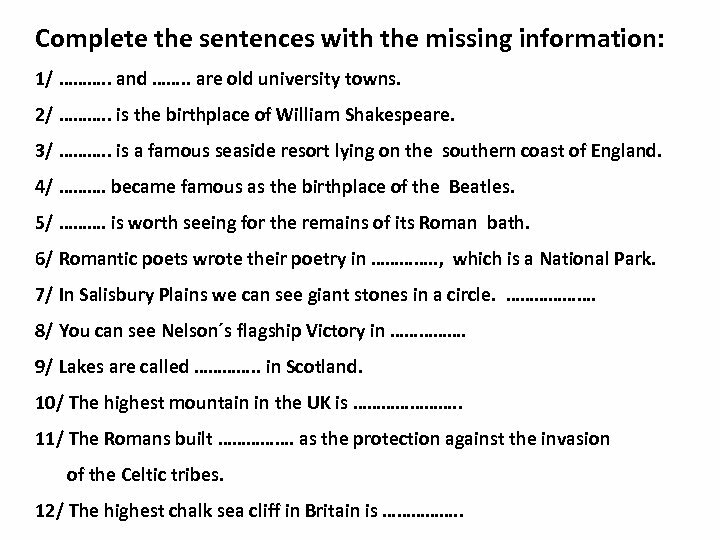 Complete the sentences with the missing information: 1/ ………. . and ……. . are old university towns. 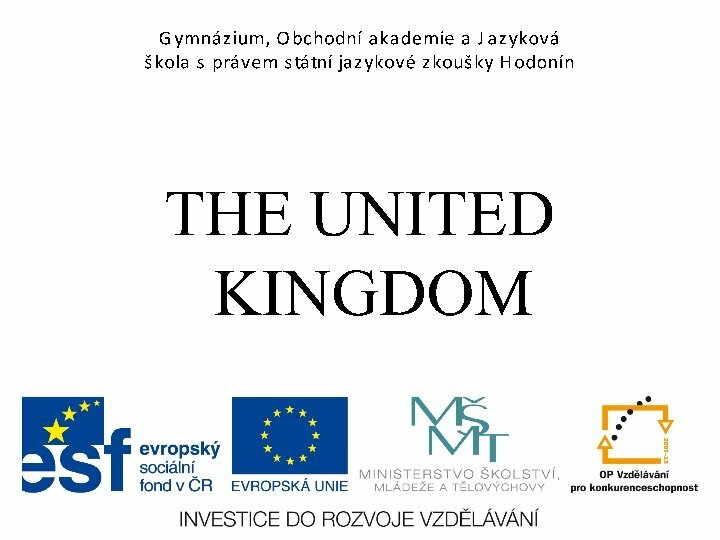 2/ ………. . is the birthplace of William Shakespeare. 3/ ………. . is a famous seaside resort lying on the southern coast of England. 4/ ………. became famous as the birthplace of the Beatles. 5/ ………. is worth seeing for the remains of its Roman bath. 6/ Romantic poets wrote their poetry in …………. . , which is a National Park. 7/ In Salisbury Plains we can see giant stones in a circle. ………………. 8/ You can see Nelson´s flagship Victory in ……………. 9/ Lakes are called …………. . in Scotland. 10/ The highest mountain in the UK is …………………. . 11/ The Romans built ……………. as the protection against the invasion of the Celtic tribes. 12/ The highest chalk sea cliff in Britain is ……………. .
Řešení Complete the sentences with the missing information: 1/ Oxford. . and …Cambridge…. . are old university towns. 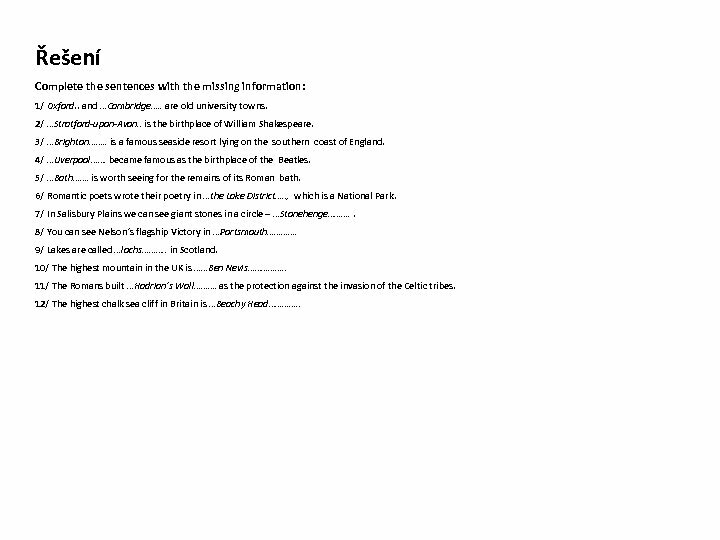 2/ …Stratford-upon-Avon. . is the birthplace of William Shakespeare. 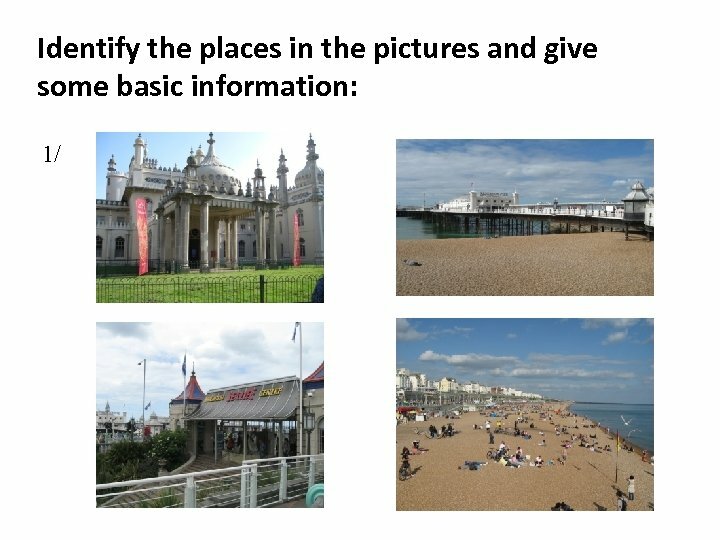 3/ …Brighton……. . is a famous seaside resort lying on the southern coast of England. 4/ …Liverpool……. became famous as the birthplace of the Beatles. 5/ …Bath……. is worth seeing for the remains of its Roman bath. 6/ Romantic poets wrote their poetry in …the Lake District…. . , which is a National Park. 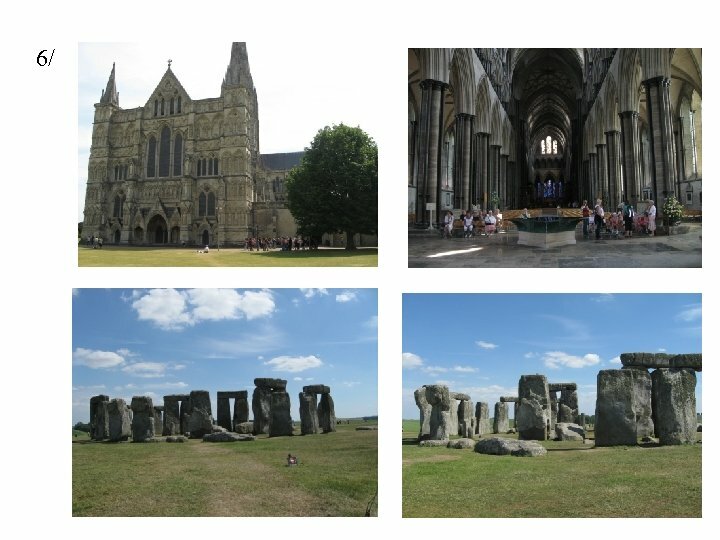 7/ In Salisbury Plains we can see giant stones in a circle – …Stonehenge………. . 8/ You can see Nelson´s flagship Victory in …Portsmouth…………. 9/ Lakes are called …lochs………. . in Scotland. 10/ The highest mountain in the UK is ……Ben Nevis……………. . 11/ The Romans built …Hadrian´s Wall………. as the protection against the invasion of the Celtic tribes. 12/ The highest chalk sea cliff in Britain is …Beachy Head…………. .
Identify the places in the pictures and give some basic information: 1/ Brighton - a seaside resort on the south coast of England, Royal Pavilion - decorated in Chinese style with an Indian exterior, built by John Nash between 1815 – 1822 for King George IV /1762 – 830/. /West Pier built over 130 years ago, probably the finest pier in the world. / Brighton Sealife Centre. 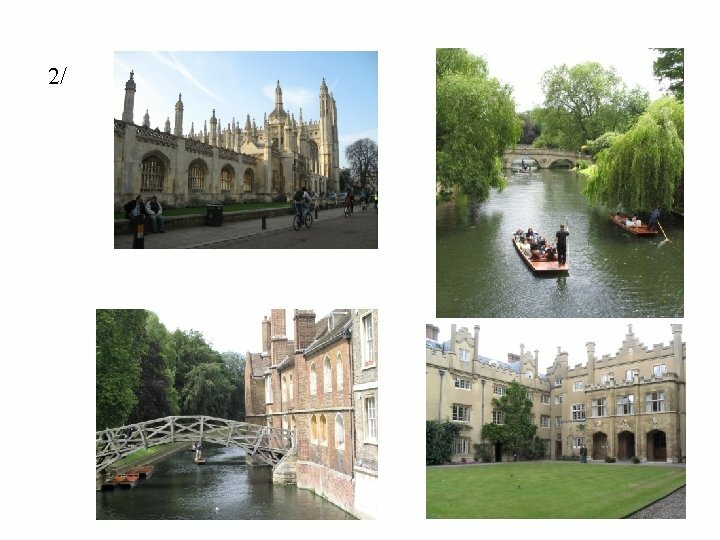 2/ Cambridge – a university town, the university is divided into colleges. /A popular activity is punting on the river Cam. /The Mathematical Bridge / Queen´s College. 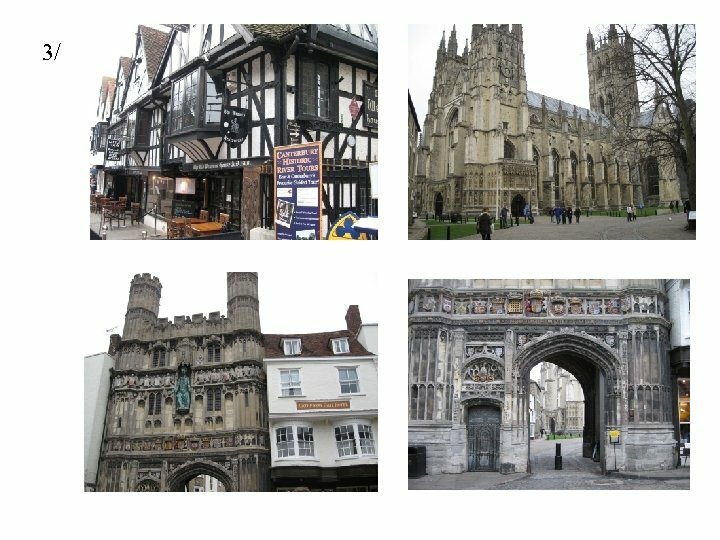 3/ Canterbury – a city 85 km south of London, famous for its cathedral built in the 11 th century /the seat of the Archbishop of Canterbury/. Archbishop Thomas Becket was murdered there in 1170. 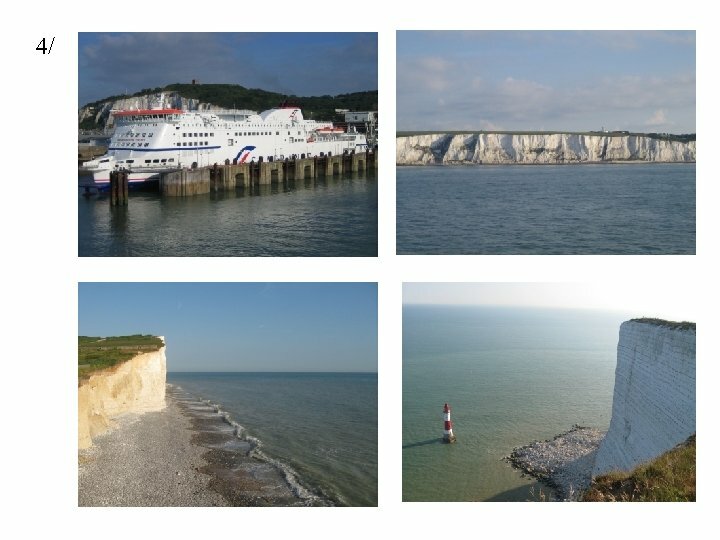 4/ Dover – Britain´s gateway to Europe by ferry or train, famous for its white cliffs. /Chalk cliffs called Seven Sisters. /The highest chalk sea-cliff in Britain called Beachy Head /160 m/. 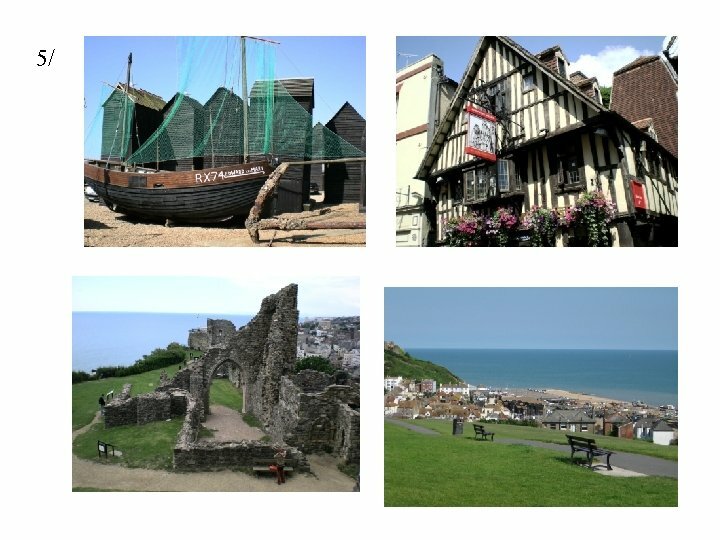 5/ Hastings – a town on the English coast in East Sussex, . The main attraction is the castle, east of it the Old Town with the fishing harbour. Hasting Castle was built by William the Conqueror, today you can visit the ruins of the castle. 6/ Salisbury Cathedral –medieval cathedral built in the early English style. Started in 1220, completed by 1258, except for the spire, the tallest in England /123 m/, which was added a generation later. In the Chapter House there is one of the four surviving originals of the Magna Charta. / Stonehenge –lying on Salisbury Plain. Huge stones in a circle, it is unknown where these stones came from. The construction could have been an astronomical observatory. 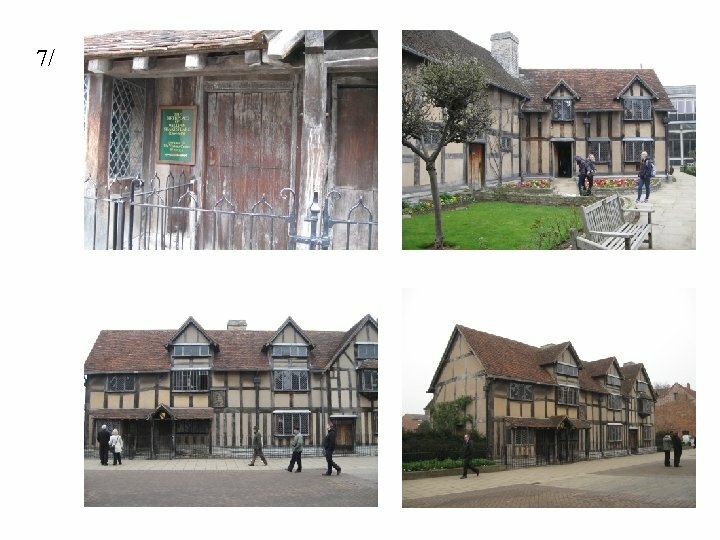 7/ Stratford-upon-Avon – the birthplace of William Shakespeare. A timbered Tudor house, where Shakespeare was born, is standing in the centre of Stratford. Now a museum. 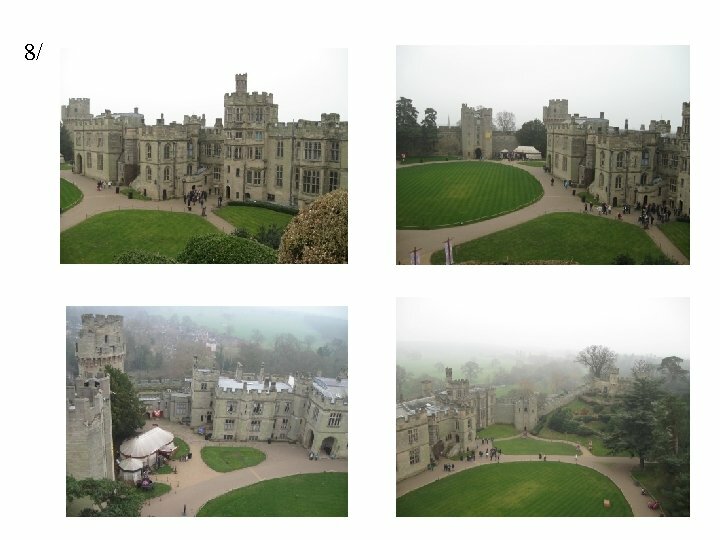 8/ Warwick Castle – one of the best known medieval castles in England, it is overlooking the River Avon /8 miles from Stratford-upon-Avon/. It is considered by many as the most beautiful castle in England.